Sometimes geopolitical changes make headlines, but other times they slip quietly under the radar. Such is the case with the flag of Belarus, which was changed without fanfare (or explanation) by a government decree back in 2012. We don't want you to miss any changes to the world's list of countries and flags, so we now present a belated report on this little-known event. Belarus, a former Soviet state in Eastern Europe, made a slight change to its flag in early 2012. On Feb. 10 of that year, the State Committee for the Standardization of the Republic of Belarus announced a minor change to the ornamental pattern on the left margin of the flag. The pattern originally occupied one-twelfth of the flag's total length, and was located inside a white margin making up one-ninth of the flag design. The ornamental pattern has now been extended to fill the entire one-ninth margin. The Belarusian government apparently provided no specific reason for the change. 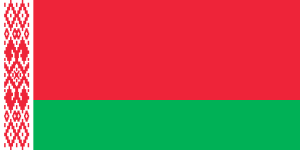 Other than this minor adjustment, the current flag of Belarus has been in place since 1995, when it replaced the traditional white-red-white flag after a controversial referendum that critics denounced as unconstitutional. Belarusian President Alexander Lukashenko supported the adoption of the 1995 flag, which is very similar to the Soviet-era flag. State-owned media argued the traditional tricolor flag was unacceptable due to its use by Nazi collaborators in World War II. The white-red-white flag was re-adopted in 1991 after the collapse of the Soviet Union, and some still consider it the rightful flag of Belarus. Opposition activists have continued to use it in protests against the Lukashenko administration. However, the flag is officially banned in the country, and many protesters have been arrested for displaying it, contributing to allegations of authoritarianism and the labeling of Belarus as a dictatorship by many international commentators. 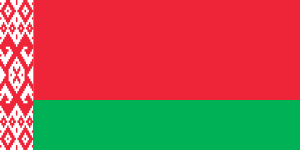 All versions of the flag of Belarus are in the public domain (1995-2012 source; 2012-present source).